Whistle While You Work…or Cook! First came jalapeno evening where we picked, cleaned and processed a gallon of fresh jalapenos and 19 half-pints of pickled jalapenos while watching the last presidential debate. We experienced a “barely-freeze” two weeks ago and my tomato vines turned brown, but the actual tomatoes were fine! So we picked a couple of gallons of grape tomatoes and yellow cherry tomatoes. They’re still waiting to be processed in our nice cool garage. I also found one carrot, we cut the pumpkin blossoms, and we found about fifty tiny basil plants that were coming up from seed. I potted about ten baby basil plants and brought them inside. Right now they look pretty happy. I’m not telling them about all their other siblings I sacrificed during last night’s freeze. I can hardly bear to think about it, much less tell their family. Cripes! THEN came chili pepper night. We have three strains of chilis: Anaheim, Hatch, and something. We never figured the last one out but it’s definitely different. We also encountered a weird moment in gardening while pulling all those glorious heat-filled beauties. [Here’s the back story…] Earlier this year, I had a chocolate bell pepper plant. But it basically disappeared. We had a few small bells, then I thought it got pulled up accidentally because one day it was simply gone. Vamoosed! We simply lost the bell pepper plant – it was so weird. HOWEVER, while we were pulling Anaheims last night, we were in the middle of harvesting about 8 or 10 big nice peppers off a particular plant when we discovered a garden miracle: Right down at the base of it…were two fully formed chocolate bells! I have no idea what happened but my theory is that the Anaheim turned into Seymore one night and ate the bell pepper plant – then had bell babies. 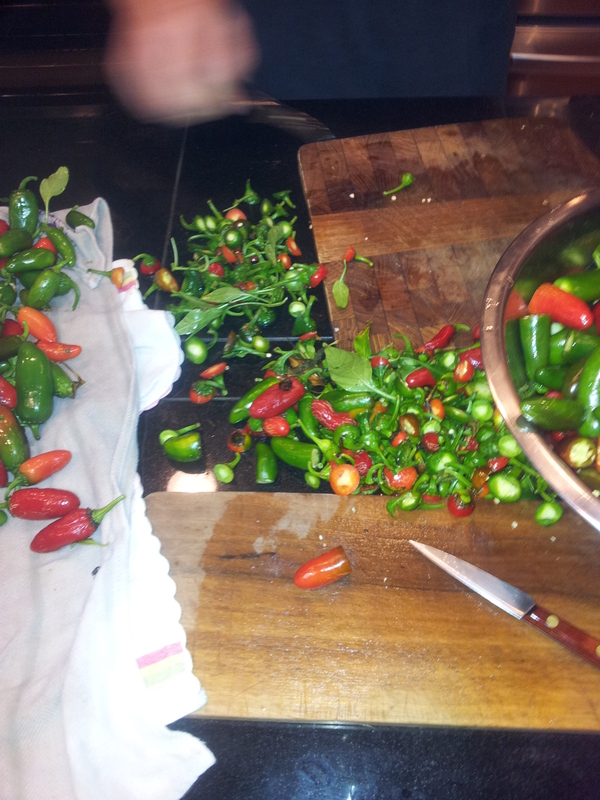 Here’s a photo of our sink full of chilis…I’m really grateful for a deep sink. The point of this post, however, is that I really enjoyed this garden cleaning process because Mick helped me every night. He normally has other work to complete like mowing the lawn, raking leaves, puttering around doing odd jobs, etc. But he helped, and it was so nice because the work went quickly. I felt like actually whistling while I worked. So, the moral of this story is that if you aren’t able to whistle because you’ve never learned, then you should try fire roasting chili peppers. Or, an alternate moral could be, if you are ABLE to whistle, then you can probably drum up a fairly spiffy duet with your peppers while roasting them.